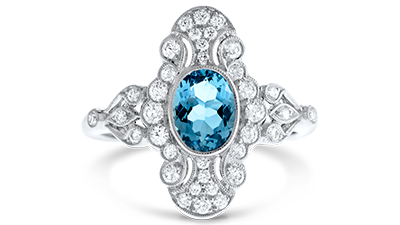 Once you’ve selected the perfect gemstone and cut, you need to consider the design and setting of the ring to be sure it complements personal style preferences and requirements. 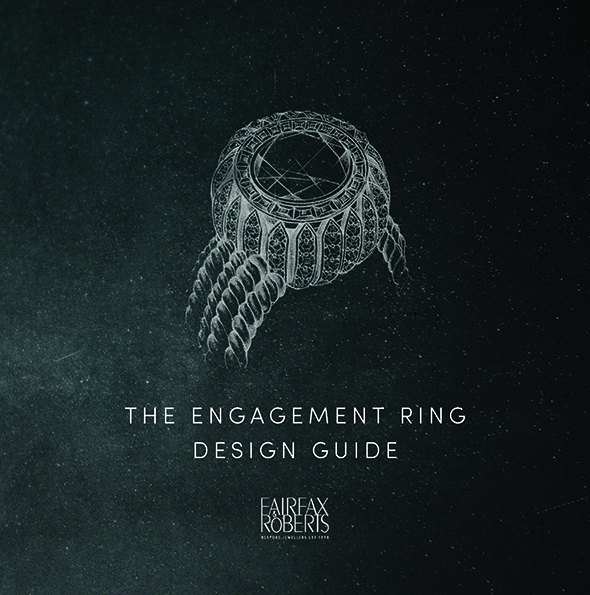 This is our engagement ring design guide to your perfect engagement ring, created by the Fairfax & Roberts artisans. Ever since Fairfax & Roberts opened its doors in 1858, we have continually challenged ourselves to learn everything there is to know about luxury jewellery – gemstones, bespoke design and meticulous craftsmanship. With this blog post, we share that knowledge with you, so that you are able to choose the perfect engagement ring. Inspired by Art Nouveau, a movement dedicated to replicating nature through art, Kerr’s ring is a unique flower design. The ring features an oval diamond surrounded by a cluster of round diamonds. While its band is yellow gold, the diamonds in Kerr’s ring are set in platinum, so as to amplify their sparkle. Historically, diamond cluster engagement rings were created to save money, as the arrangement of smaller gems within the cluster setting aimed to replicate the appearance of a large diamond solitaire. Unfortunately, whilst the clusters within these rings imitated the silhouette of a larger diamond, they did not sparkle as brightly as a solitaire. As time progressed, jewellery designers found that the cluster design increased in popularity, as the setting could be arranged into beautiful and unique shapes. This prompted jewellers to find a means to increase the brilliance of the design through the development of a dome or contoured setting that allowed each stone to fit together more closely and capture light from different angles. This technique is implemented in the slight curvature of Kerr’s ring, giving the diamond cluster more interaction with light allowing it to sparkle at its fullest. At Fairfax & Roberts, we suggest a claw setting for your diamond cluster design. This setting is the best for placing diamonds side by side, and shared claws minimise the use of metal. The cluster setting is also a special way to use heirloom diamonds or other precious stones from family jewels that are no longer worn. These gems can beautifully be incorporated into your ring’s design, mixing old and new stones into a, particularly extraordinary piece. 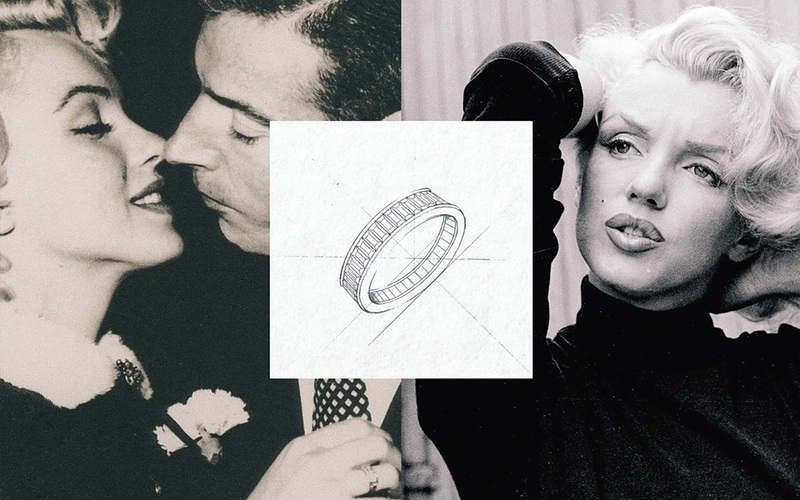 On their wedding day in January, 1954, Yankees legend Joe DiMaggio gave Marilyn Monroe a gorgeous platinum eternity band with 35 baguette-cut diamonds. A stone later fell from the ring, disjointing the band and leading critics to suggest it symbolised their broken relationship, which ended less than a year later. Nevertheless, while their union didn’t stand the test of time, Monroe’s ring is admired to this day. Eternity rings date back 4,000 years when Egyptians presented them as a token of their eternal love. These rings were simply a metal circle, designed to symbolise a snake devouring its own tail. 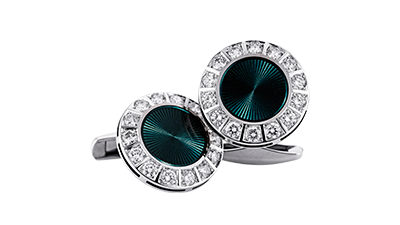 Millennia later the eternity ring remains a symbol of everlasting affection and is often gifted to represent a particular milestone, such as an anniversary or the birth of a child. The eternity ring can be purchased as either a full eternity ring, in which stones are set around the entire band or a half eternity ring, which has stones set partially around the band. As it is very difficult to adjust a full eternity ring, few jewellers keep a sample range in stock. Moreover, as it has double the amount of diamonds on the band, and needs to be custom ordered, a full eternity ring can cost up to three times as much as a half eternity ring. Setting plays an extremely important role in the aesthetic of an eternity ring. Monroe’s ring was designed with a channel setting, in which the metal forms a channel at the two edges of the ring where the stones are set. This is a secure setting, as it is not prone to snagging, and gives Monroe’s ring its slim, elegant appearance. Channel set eternity rings are a more contemporary design, with the channels separating each stone becoming part of the ring’s aesthetic. 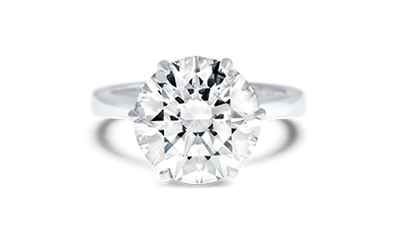 A claw setting is another beautiful finish, with metal prongs holding the stones in place, leading it to be a better suited to round brilliant stones. Eternity rings are primarily made in the two most valuable metals, platinum and gold. A good way to choose the metal for an eternity ring is through making sure it matches the wearer’s existing jewellery, particularly if it is going to be worn stacked between a wedding and engagement ring. Customers who choose a gold eternity band must also decide on the most appropriate gold content, or karat type (K). If the wearer’s wedding band is 18K gold, opt for an 18K gold eternity ring, as a 9K gold eternity ring is more likely to scratch an 18K gold ring and vice versa. This is not as much of a problem for platinum eternity bands as unlike gold, this metal is used in its most pure form, which is approximately 95 percent. 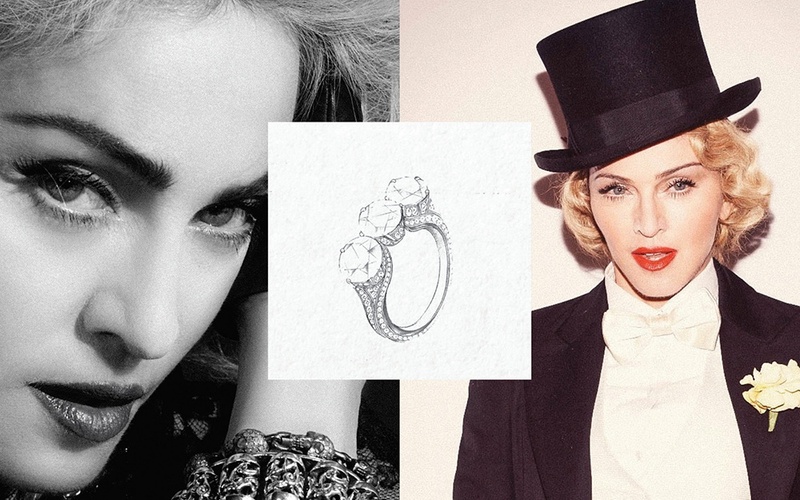 Known as an ever-changing style icon, buying the perfect engagement ring for Madonna would have been no easy feat. Former husband Guy Ritchie certainly stepped up to the plate, choosing a stunning 5-carat, three-stone diamond ring after the birth of their son Rocco. Set on a platinum band, and designed by Neil Lane, the ring is Edwardian in style and, true to the era, has a particularly romantic design, with small pave diamonds decorating the band. The three-stone engagement ring, also known as a trilogy ring, is symbolic of the time that you have spent with your partner. The three diamonds that make up the ring represent the past, present and future. A great way to personalise your or your partner’s three-stone engagement ring is through using coloured gemstones as accents to the central diamond. 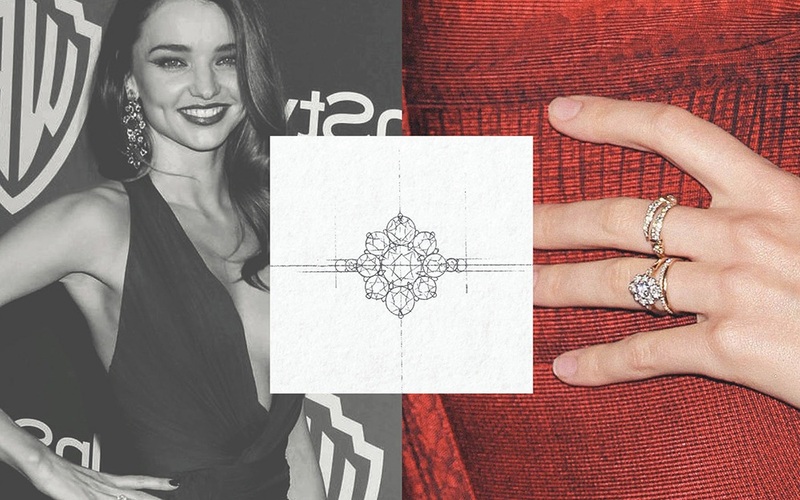 Other options include mixing and matching two cuts of another style, such as a round brilliant with marquise style diamonds as seen in Jessica Simpson’s ruby and diamond ring. Three diamonds mean three baskets and decorating the mounting of each stone can be another great way to add a unique touch to your ring. The baskets of Madonna’s ring are stunning; with small diamonds set in pave and separated by intricate lines that join each diamond together. If you’d prefer a simpler design, opt for a cathedral setting, and ask your jeweller how the basket of your ring can be decorated. Browse our three stone engagement rings here. Choosing the right diamond grade for each stone is particularly important to the overall aesthetic of your three-stone ring. This is because lower-grade diamonds have yellow tints, something that will be particularly noticeable when placed next to a diamond of a higher quality. 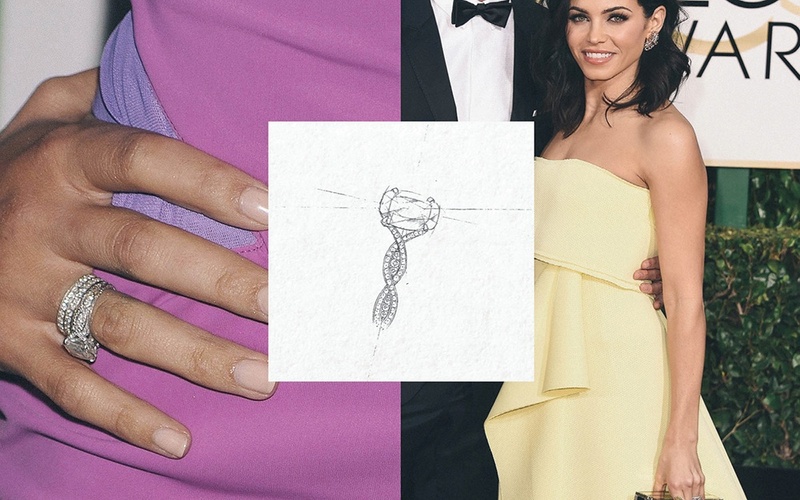 Jenna Dewans’s solitaire engagement ring from Channing Tatum is an intricately detailed Neil Lane design. The ring supports a magnificent 1.62-carat, cushion-cut diamond with a pave-encrusted, twisted shank. Dewan’s engagement ring looks stunning next to her two channel-set eternity rings, a combination that works particularly well with the simplicity of the solitaire. The shank, or what is often referred to as the band, is a significant part of a ring’s design, affecting its appearance and feel. There are many different ways that a shank can be designed, from the metal used to the decoration of the basket or the inclusion of pave. For those who are looking for something other than a simple band, the split shank is a popular choice. In this style, the band parts as it reaches the centre setting, often showing a visible gap between the band and the centre diamond. Aside from its aesthetic, a split shank is a good choice for a ring with an exceptionally large diamond. This is because it balances the ring through using less metal to hold the diamond in place and adds clear space, to maintain an elegant effect. The twisted shank style is a wonderfully unique style, in which the metal of the shank twists, forming a romantic, interlacing design around the finger. Dewan’s band is particularly stunning as it deviates from the classic two-part twist, and has three delicate interlacing parts. These parts are set with micro-pave, infusing the ring with a sense of old-world glamour. While this style is exquisite, keep in mind that the twist makes resizing the ring very difficult, especially if you choose to add pave. If you like the look of Dewan’s engagement and wedding ring combination, Fairfax & Roberts can create a style in which the two are permanently joined. This is also known as an interlocked shank and has many different interpretations. One way to create this design is through fashioning an engagement ring with two split, parallel bands – the wedding ring will then fit inside. The second is to fashion a wedding ring with the exact detailing and design of the engagement ring and to then fuse the two together. Like all jewellery, split or twisted shank diamond rings need the right amount of care to keep them in perfect condition. The narrow splits of this style can attract dust and dirt, but it is not advised to dig debris out with a sharp object as this can damage the ring. We suggest that you soak your ring in a cleaning solution so that it can dissolve any impurities deep inside the split, particularly in its cleft. We hope the engagement ring design guide has been helpful and we look very much forward to welcoming you to Fairfax & Roberts for a complimentary ring design consultations. Finding your engagement ring style doesn’t have to be a task fraught with potential style danger. 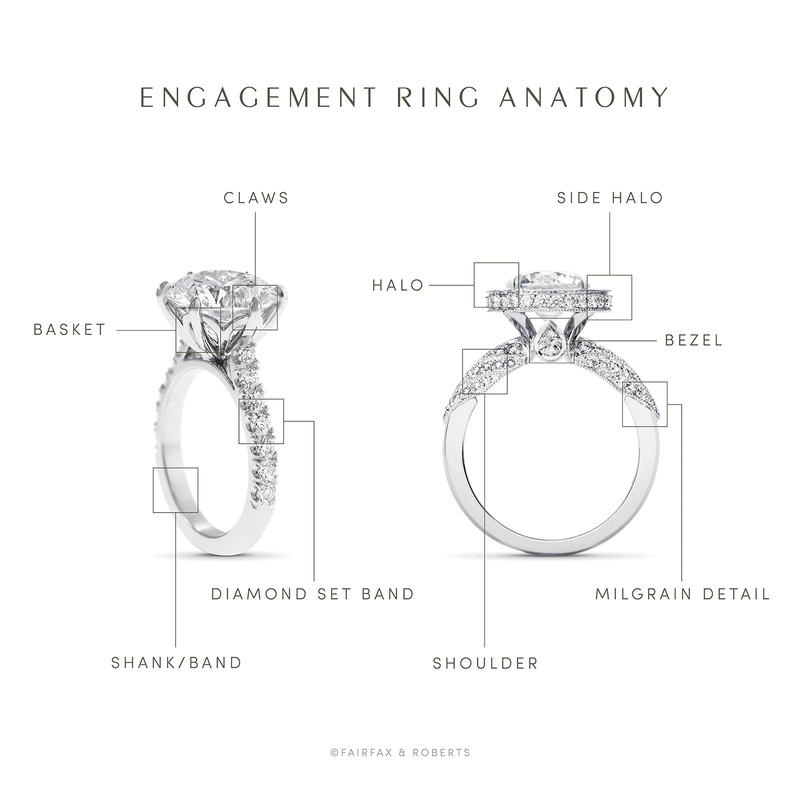 As a supplement to the engagement ring design guide and to make it easier, we’ve created a simple quiz (for your partner, but who says you can’t give him a little help by testing it yourself?). After all, you’ll be wearing this ring forever, so it’s an important decision to get right. So, test your buzzer and get ready to find your engagement ring style here. Platinum Vs. Gold – Which Metal Is the Best For Your Engagement Ring?